Rosalind and Robbie don't want to spend the summer stuck in their dad's new house with irritating Smash and her glamorous mum. Dad's biggest wish is for everyone to get along. So when he suggests a picnic in some nearby woods the children grudgingly agree. That afternoon, in a golden sandpit, Rosalind makes a wish of her own and something extraordinary happens. It just might change their summer from weeks of bickering into the best holiday Rosalind, Robbie, Smash and their little sister Maudie have ever had . . . 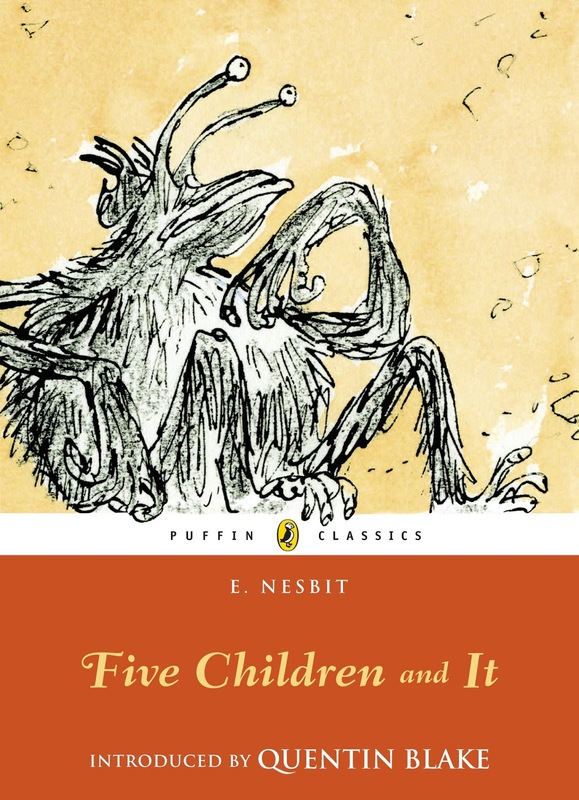 This book could, at first glance, be called a complete rip off, of the book Five Children and It. A closer look, and having read the book, it comes to light that what this book really is, is a celebration of a classic. 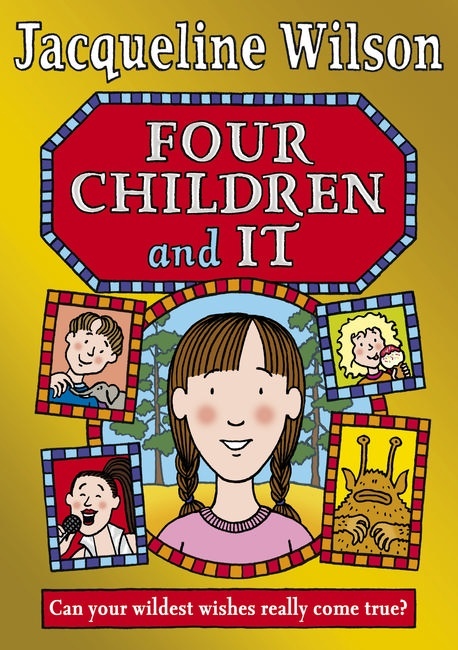 In true Jacqueline Wilson style, this book is about family, it just so happens that the girl in this story is an avid reader whose favourite book of the moment is Five Children and It by Edith Nesbit. Imagine their surprise when a picnic in the woods reveals the one and only Psammead, buried in a sandpit in the woods. It’s the summer holidays, and Rosalind (Rosy) and her brother Robbie are going to stay with their Dad. Samantha (Smash) is having to spend the holidays with her Mum, Alice. Here’s where tings get tricky, Rosy and Robbie’s dad is married to Smash’s Mum, and the three children are far from the best of friends. The one good thing is Maudie, their little half sister, they all love her, so she is the bright spot in what could be a horrible holiday. As with many of Jacqueline Wilson’s books we get a look inside a somewhat complicate family unit. Each of the children have their own issues, concerns and fears about how their parents feel about them, and where they fit in, within the new family dynamic. Rosy’s way of coping is losing herself in a good book, Robbie finds comfort in his collection of plastic animals, and Smash seems to get great pleasure out of tormenting her step siblings. It’s the discovery of the Psammead on what they though would be a boring family picnic that begins to bring the three together. The Psammead is a creature as old as time, that has the ability to grant wishes. As Rosy has read the boo Five Children and It, she knows a few things about this. Firstly the wishes only last until nightfall, and the wishes must be very specific, as the Psammead will take things quite literally. Each of the children get the chance to make their own wishes, and as you can imagine some are fantastic and some turn out not so well, but it’s by being thrown together on these adventures that the three new siblings get to know each other better, and start to become closer. As I mentioned at the start, this book is like a modern day Five Children and It, Rosy, Robbie, Smash and Maudie even make a wish to go back and meet the children form the original book. There will be people out there that think this is wrong, but I am hopeful that what this book will do, is encourage readers to go out and read Five Children and It, along with The Phoenix and the Carpet and The Story of the Amulet. It’s an old fashioned fantastical adventure, set in the middle of modern day family life, that sounds like an OK mix to me.